Well, choosing the best carbon arrows isn’t as easy as you may think. Every arrow is different and comes with its own perks. And you have to consider some basic factors before going ahead and spending a great amount of deal on them. 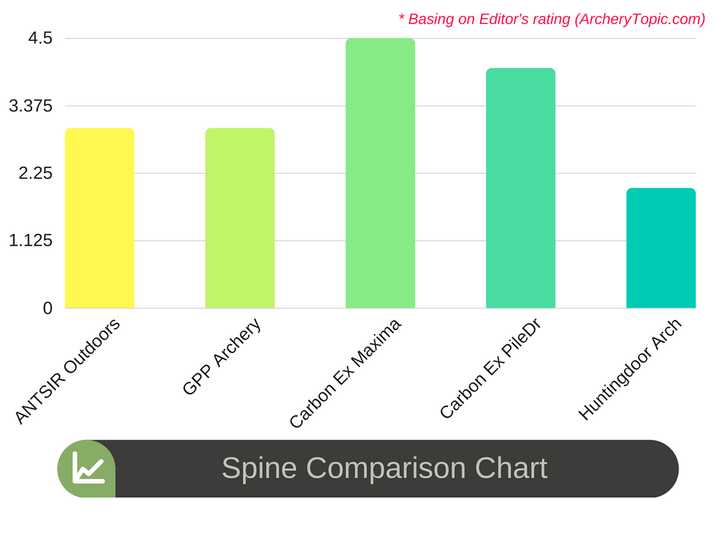 Spine rating is usually the measurement of an arrows stiffness. If an arrow doesn’t have the perfect balance of stiffness, then it becomes less efficient in hitting the target. Why Spine Ratings Matter ? When someone shoots an arrow, throughout the whole cycle, a vast amount of energy transfers to the arrow from the bow. It creates enough force to make the arrow oscillate and flex. If the arrow oscillates too much, then it won’t hit the target or have a hard time going straight. On the other hand, if it doesn’t oscillate at all, then it won’t be able to clear the bow. The great carbon arrows would have the perfect balance of flex, giving it the necessary stiffness for flying straight. Usually, too stiff arrows would result in going left and too weak arrows tend to go right side. Moreover, a weaker hunting arrow will have a spine rating of 500 and the perfect arrow should have a rating very close to 300. A rating of 300 would mean that it’s much stiffer than a rating of 500. On the other hand, the stiffness seems to increase with the weight. That's why a heavier arrow will be more prone to be stiff. The arrow diameter: Depends on the width of the arrow. The thickness of the arrow walls: Normally every arrow is hollow inside, but the wall thickness seems to vary from arrow to arrow. This thickness has a great influence on the overall weight of the arrow. Arrow material: Arrows are mainly made of three material: wood, carbon and aluminum. Some arrows are made of carbon-aluminum combo. This material puts a great impact on the weight. You should always choose an arrow that is directly linked to your bow. In general cases, lighter arrows are used in lighter bows and heavier arrows are used for heavy bows. Hunters typically favor heavier arrows instead of lighter ones as they tend to have the more kinetic energy to go a long distance and strike hard. Lighter arrows are more suitable for archery practice or tournament. It tends to be faster than heavy ones as, heavier arrows preserve more kinetic energy, making it slower. If you are starting off as a beginner. First of all, you should start shooting with the same weight and later switch heavier and lighter weight. Anyways, a perfect arrow would be between 200 to 500 grains. Best for both target practice and hunting. 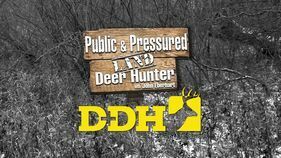 Hunters mainly prefer thinner ones instead of thick one. The thin ones are less affected by wind so that makes it a perfect choice for hunting. Also, thinner arrows have better penetration depth than thicker ones. If you are looking for arrows more suitable for archery then you should always go for thicker ones. An arrow with thicker diameter will be more prone to link through the outlines on the target, giving you a perfect score. Thicker ones are also used for a 3D archery sessions where people usually shot at animal replicas rather than round ones. Arrow diameter plays a vital role in archery competitions. A specific diameter is allowed only and using above that range can disqualify you. The length of the arrow must be perfect. It actually depends on few factors such as the type of the bow, the position of the arrow rest and the draw length of the bow. Too short arrows compared to the bow can be very dangerous for you. Even if the arrow just fits the bow, still it’s not perfect. On the other hand, if the length is too large, it might become a problem to handle the whole set up. Arrows a little bit larger than the bow would be better, even perfect. The arrow should sit at least 1" beyond the arrow rest when the bow is at full draw, that is the perfect arrow length. A too short arrow can lodge behind the arrow rest at full draw and the arrow could collapse and crack upon release. You need to know the measurement of the draw length of the bow. It is not necessary at all to match the bow draw length to the arrow length, though people may think so. When the bow is at full draw the distance between the grooves of the nock to a position 1.75” beyond the grip pivot point is the length of the draw of the bow. Or simply, we can say that when the bow is drawn back the distance from the nock point to the front of the riser is the draw length. So, it is okay on maximum setups if the arrow is slightly shorter than the adjusted draw length of the bow. Straightness is the second most important category. When there were no carbon arrows straightness was the biggest area to think about. But with the whole carbon arrows, straightness is not a fact to fear. Still, straightness is important. When you launch an arrow a frequency vibration occurs there. This frequency will be literally consistent and the shooting will be great with a straight arrow. But the frequency would change when we bend the arrow, so the oscillation. 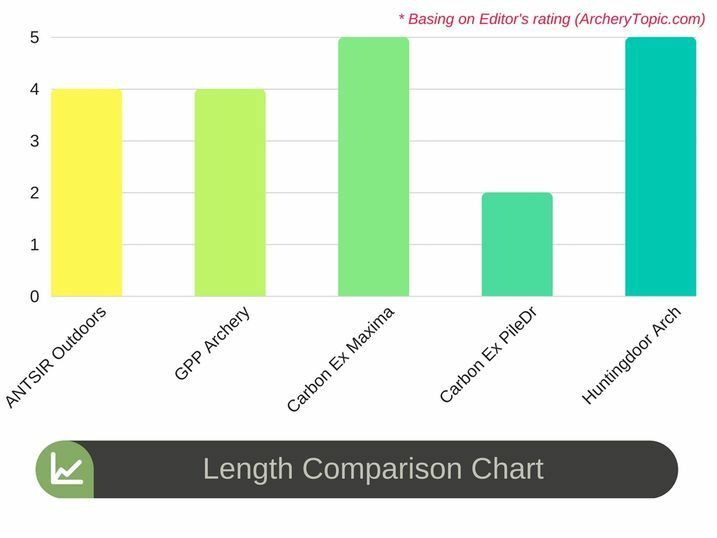 Though you cannot bend a whole carbon arrow, straightness still matters to choose the top rated carbon arrows. It is quite possible that the carbon arrow may not be a pure carbon arrow. Straightness of an arrow is divided into few classes. Standard-grade carbon arrows have a straightness of +/-.005-.006". These shafts are especially for the beginning archers and the hunters. These arrows are more than enough for the big hunting game. A basic carbon shaft with +/-.006" straightness is straighter enough to use with any kind of bow setup. Mid-grade shafts with the straightness of around +/-.003-.004" are better than the standard-grade arrows. If we want to have the best ever arrows, there are also pro-grade arrows of +/-.001-.002" straightness. 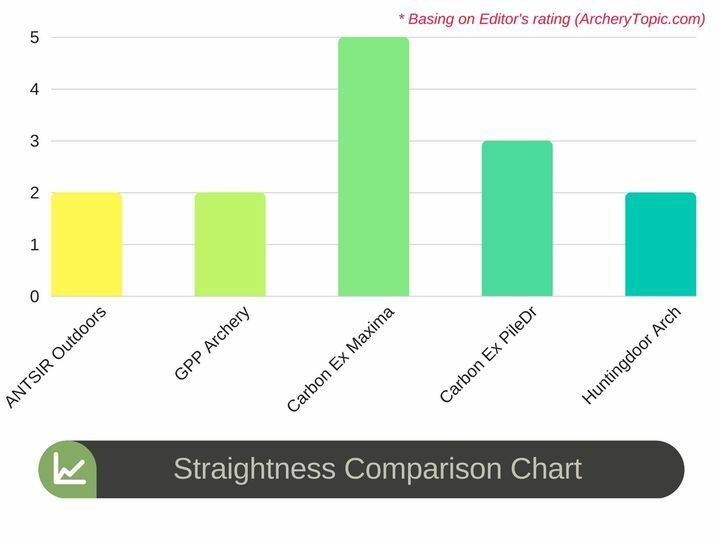 Arrow straightness undoubtedly does matter. It will be best if we use the arrow of higher straightness for hunting or an archery game. Less straightness can cause any kind of damage while shooting. 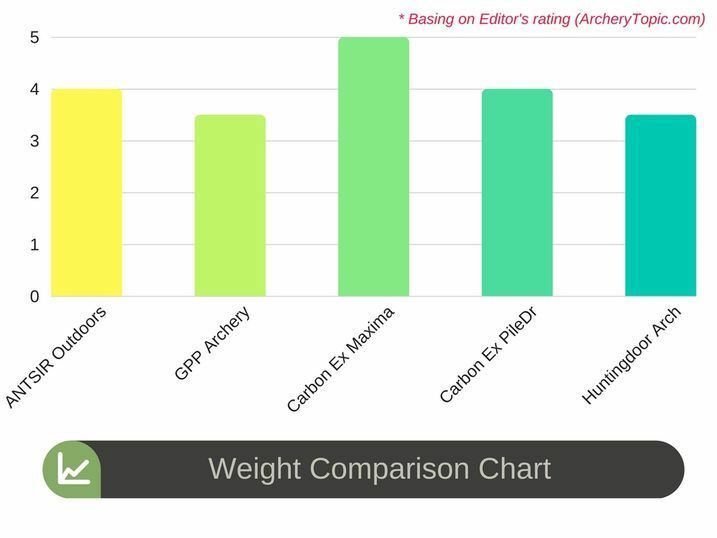 Evaluating all the performance from all of the categories, Carbon Express Maxima RED Fletched Carbon Arrows gets the crown. 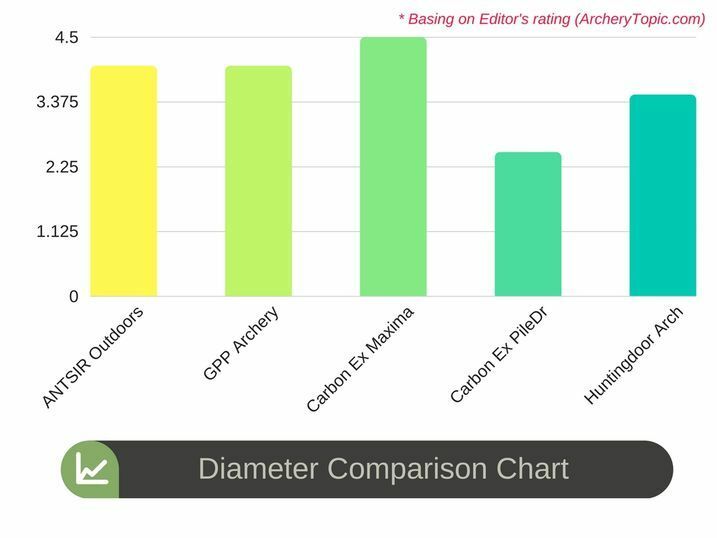 With a splendid score of 24/25, sure it is the best carbon arrows from the list. Suitable for any situation if you ask me. I really hope you enjoyed reading the article. I’ve compiled every detail for helping you decide the right one and I’m sure you won’t have any confusion anymore. Comment below and let me know what you think and don’t forget to share it!